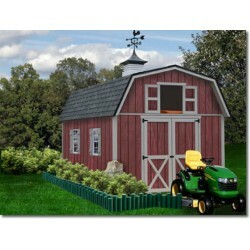 Best Barns offers some of the highest quality 2x4 wood storage buildings in the USA market. Everything is pre-cut ready for assembly and pre-primed ready for your finishing coat of paint! Free Shipping on all orders! 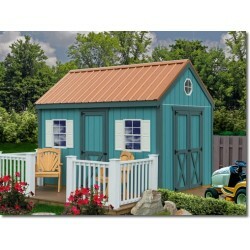 Curb Appeal... the Danbury storage shed kits gable roof design blends handsomely with styles of todays homes. High sidewalls provide maximum storage in a small area.Perfect for your backyard storage needs the 8x12 has plenty of room for you lawn and garden tools. FREE Shipping! Our Aspen wooden storage shed kit delivers storage attractively. 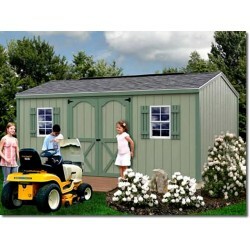 Because this shed is wider than it is deep it is perfect for a small lawn or pool area. Unique design blends into any backyard setting with enough space for all your storage needs. FREE Shipping! The Elm's gable roof design blends handsomely with styles of todays homes. The 6'-3" high side walls provide maximum storage in a small area. 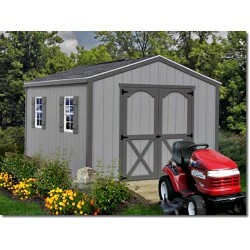 With the large 5'-3" x 6' doors you can easily store your riding lawn mower or 4-wheeler. 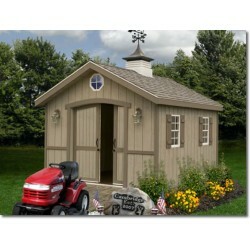 If you are need a well built wood storage shed at an econimcal price the Elm is the perfect solution. FREE Shipping! The Cypress's gable roof design blends handsomely with styles of todays homes. The 6'-3" high side walls provide maximum storage in a small area. 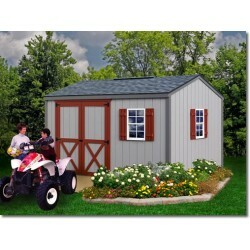 With the large 5'-3" x 6' doors you can easily store your riding lawn mower or 4-wheeler. FREE Shipping! 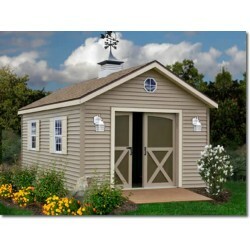 Our Regency offers a lot of storage for a 8'x12' storage shed kit. Featuring a 9/12 pitch roof whichs allows for great storage in the overhead loft area. Loft area is provided at both ends of the shed kit. The double door is large enough for a lawn mower and gives access without having to move other items around.FREE Shipping! Our Woodville provides maximum storage in a small space. The Woodville storage shed kit offers high side walls and a upper loft creating ideal storage space for all your lawn and garden needs or household items you need to find a place to put. 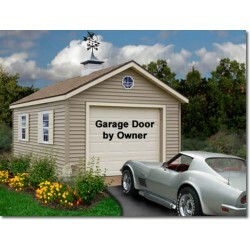 * shown with optional windows and cupola FREE Shipping! Our Mansfield is an attractive addition to any backyard. 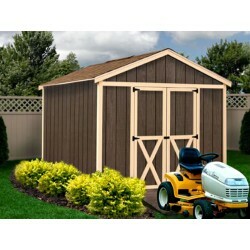 This outdoor storage shed offers plenty of room for all your lawn and garden tools.The 5'-4" wide door opening can accommodate your riding mower or four wheeler. Offset doors create a large storage area on one side. FREE Shipping! 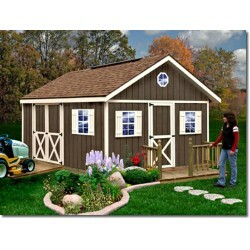 The Meadowbrook wood storage shed kit has a 2nd floor loft area for additonal storage. The loft is accessible by a 4' opening inside and a 2nd floor loft door so you can get at what you need when you need it. 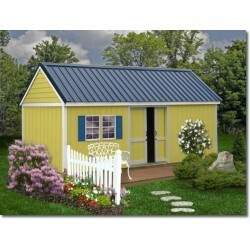 * shown with optional windows and cupola FREE Shipping! Our Brandon will be the perfect addition to any backyard. The Brandon can comfortably store all your tools and gardening supplies. FREE Shipping! The Greenbriar prep for vinyl garage kit is the perfect single car garage. With its high headroom and the ability to extend building depth you will have plenty of room for your vehicle and storage or work area. FREE Shipping! 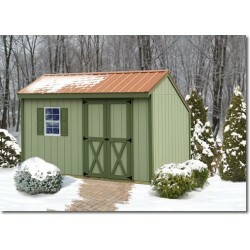 The Cambridge offers unique pocket doors that sets this shed into a class of it's own. 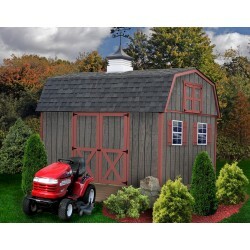 One of Best Barns most popular wood shed kits this model is both functional, attractive and will make a great addition to any back yard. FREE Shipping! The Fairview has a convenient walk-in door and larger (5'-4" wide opening) doors on the sidewall makes a very flexible storage shed. 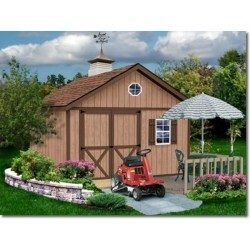 Add an attractive looking shed to your backyard to handle all your lawn and garden storage needs. * shown with optional windows FREE Shipping! 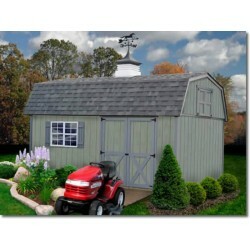 The New Castle shed kit offers an attractive way to meet all your storage needs. Big enough for storing your tools and household items and still have room for all your lawn and garden equipment. 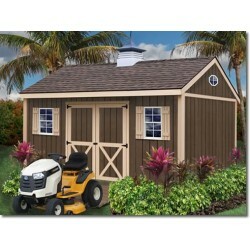 The 5'-4" wide door opening can accommodate your riding mower or four wheeler. Offset doors create a large storage area on one side. FREE Shipping! 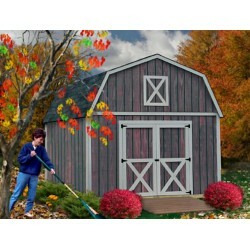 The South Dakota vinyl-prep shed kit offers an attractive way to meet all your storage needs. Vinyl-prep means the South Dakota comes with an underlay for applying siding of your choice. This can be vinyl, cedar shake, stucco, etc. FREE Shipping! The Brookfield shed kit provides plenty of storage. Just the right size for any backyard and big enough for storing your tools and household items and still have room for lawn and garden equipment. FREE Shipping! 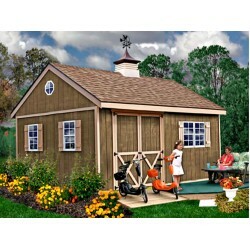 The Denver Shed Kit is a perfect choice for adding extra storage to any backyard. 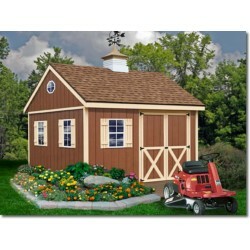 With it's traditional barn style appeal, high side walls and peak height you'll have plenty of space and many years of use out of this wooden shed kit. FREE Shipping!